ABOVE: Our kind of driving in Switzerland. We don't drive in Switzerland. Why? Because it's hardly ever necessary, and we'd rather not be burdened with a car (and the hassles of parking it) when we're enjoying Swiss cities, villages, and countryside. Over the past 150+ years, the Swiss have spent billions of francs on the world's finest network of trains, buses, boats, funiculars, aerial cablecars, trams, and chairlifts. You can go nearly anywhere in Switzerland with a Swiss Pass in your pocket. So why view the countryside through a bug-splattered windshield like a tourist in California, New Jersey, or Texas? 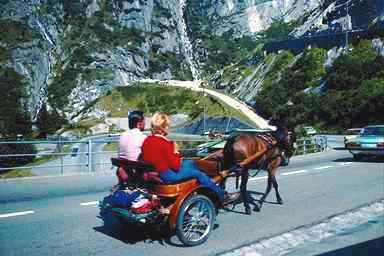 The Touring Club of Switzerland's Web site is devoted mostly to sales and customer service for Swiss motorists, but it does have useful travel information for visitors. Like the Touring-Club Suisse, the Automobile Club of Switzerland is geared to residents, but its Google-translated site may be worth a look. Enter your Swiss departure and arrival towns, choose the kind of routing you want, and Finaroute will generate a detailed itinerary. What to do when you commit a traffic sin and get caught. Did the BMW that blew by you come from Schwyz or Solothurn? Here's how to tell. This long-established firm has a wide range of cars from Peugeot, VW, Audi, Mercedes-Benz, and other manufacturers--including high-performance sports cars from a partner based in Z�rich. Auto Europe also offers Peugeot "Buy Back" short-term leases for travelers from overseas. If you're driving in Europe for 17 days or more and your permanent residence is outside the European Union, a Renault EuroDrive short-term lease can be significantly cheaper than renting. In addition to cars, vans, and SUVs, this long-estblished rental firm offers motorhomes for pickup in France, Great Britain, Germany, and Spain. This Swiss firm has a "handover place" in Bieberist, a village near Solothurn that can be reached by hourly trains from Z�rich and Geneva Airports.